Dialysis and deliveries ahead for High Prairie. Sarah Bowdridge, left, holds her infant daughter Kadince in Grande Prairie. 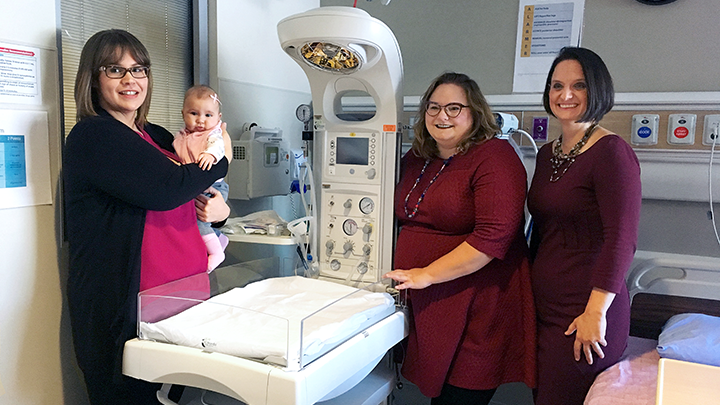 Health Minister Sarah Hoffman and Danielle Larivee, MLA for Lesser Slave Lake, announced the official launch of the new obstetrics program at the High Prairie Health Complex on Feb. 6. HIGH PRAIRIE — Families across the High Prairie region now have access to more healthcare services closer to home. Minister of Health Sarah Hoffman, Alberta Health Services (AHS) leadership and local dignitaries gathered to officially launch a new obstetrics program, as well as funding for a permanent dialysis clinic, at the High Prairie Health Complex on Feb. 6. The new obstetrics program, launched in January, will expand over the next several months. Prior to opening the new program, staff in High Prairie could only offer emergency births and C-sections. Most families faced a drive to Peace River, Grande Prairie, Slave Lake or Edmonton to deliver their babies. Sarah Bowdridge was one of those mothers. She gave birth to her daughter Kadince in October at the Queen Elizabeth II Hospital in Grande Prairie. The hospital expects to support about 100 mothers and families each year. A core group of staff and physicians have completed education and advanced training in obstetrical services, including anesthesia for safe C-section operations, as well as prenatal, labour and delivery care. “Keeping families together in their own community enables them to maximize their time together, and not spend hours driving to another centre,” says Greg Cummings, Chief Zone Officer, AHS North Zone. Also in attendance were: MLA for Lesser Slave Lake Danielle Larivee, councilors from the Town of High Prairie, Big Lakes County, representatives from the Lesser Slave Lake Health Advisory Council, as well as many staff, residents, patients and family members. The province is also investing $5.2 million to build a new, permanent dialysis clinic in the hospital. Renal patients in the High Prairie area currently travel outside their community for treatment, either to Slave Lake and Peace River, both more than 100 km away, or to Edmonton, almost 400 km away. Renal dialysis requires patients to visit a clinic several times a week for hours at a time in order to filter and cleanse their blood. When construction of the dialysis unit is complete in 2020, the clinic will be able to provide dialysis services to up to 12 patients. New dialysis clinics have also opened in Whitecourt, Hinton, Lac La Biche and Edson since the beginning of 2018. These clinics, plus the new one for High Prairie, can treat up to 42 patients in northern Alberta, closer to home.